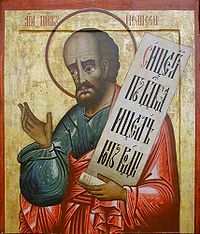 Elisha (Hebrew: אלישע, ʼElīshāʻ; Greek: Ἐλισαῖος, Elīsaīos; Latin: Eliseus; Arabic: إليسع, Ilyasaʻ; "Name means::God is Salvation"), (fl. 906 BC-839 BC according to Ussher, or 861 BC-796 BC according to Thiele) is the second of two great prophets of God who prophesied to the kings of the Northern Kingdom of Israel. He began as a student of the great successor of::Elijah but had a much longer career than his master had had, a career that spanned the reigns of three of its kings (including the great Jehu) and the brief viceregal period of a fourth. The Bible says little of the origins of Elisha, other than his father's name, Shaphat. One fine day, he was plowing a field with twelve teams of oxen, when a strange man came up to him and threw his mantle on him. Elisha recognized this man at once as Elijah. He then asked Elijah for permission to say good-bye to his father and his mother. Elijah granted him leave, and Elisha took one of the teams of oxen, killed them, boiled them together with their equipment, and served their flesh to his family for a last meal together. From then on Elisha became Elijah's student and acolyte. This meeting took place in the twelfth year of the reign of King Ahab and Queen Jezebel. Ten years later, Ahab was dead, and Ahaziah, Ahab's son, had died miserably. At this time Elijah asked his student to follow him to Bethel, and then to Jericho, and then to the bank of the Jordan River. Fifty witnesses watched from a distance as Elijah took his mantle, wrapped it, and struck the waters of the Jordan. The waters parted, and master and student walked across on a dry riverbed. Once on the other side, Elisha asked his master for one last favor: that he should have a "double portion" of the spirit of Elijah. Elijah offered no guarantee, but said that if Elisha would see him as he was being carried off to heaven, his favor would be granted. Elijah did go up in a chariot of fire drawn by horses of fire. Elisha saw it and cried out, "My father, my father, the chariot of Israel, and its horsemen!" Elijah disappeared, but Elisha did see his face one last time. Elisha also caught Elijah's mantle, which he dropped as he went. Elisha tore his clothes into two pieces. But he took the mantle, and just as his master had done, he struck the waters of the Jordan and was able to re-cross on a dry bed. The witnesses awaited him on the other side and asked his permission to send a fifty-man search party in the mountains to look for Elijah. Twice Elisha refused, but at last he gave up and let them search. The search party, of course, found no trace of Elijah, whereupon Elisha reminded them that he had told them that such a search would be futile. The city fathers of Jericho then complained to Elisha that the water had dried up. Elisha asked for a new vessel full of salt. This he poured into the city spring, and then pronounced that God had healed the waters. Jericho's water would not fail again for centuries. Elisha's reception at Bethel was less kind: several young toughs hazed him because of his bald head and suggested that he ought to go up to heaven just as Elijah had done. Elisha rounded on them and pronounced a curse--whereupon two female bears came out of the wood and mauled forty-two of them. After that, Elisha traveled to Mount Carmel and then returned to the city of Samaria. Early in his reign, King Jehoram of Israel assembled a coalition consisting of himself, King Jehoshaphat of the Southern Kingdom, and the king of Edom (still a vassal state of the Southern Kingdom at the time), to attack the kingdom of Moab, which had rebelled against the Northern Kingdom upon the death of Ahab. The coalition army marched for seven days through the Idumaean desert--and then ran out of water. How this happened, the Bible does not explain. Elisha became involved when the three kings came to see him. At first Elisha did not want to deal with them, because Jehoram was one of them. But Jehoram begged Elisha to reconsider, because it seemed that God had brought the three kings together for Moab to deal them a crushing defeat. Elisha would not have been convinced, had not Jehoshaphat been part of that coalition, because Jehoshaphat had developed a sterling reputation that presumably dated back to the ten years that Elisha had studied under Elijah. In fact, Elisha specifically told Jehoram that only for Jehoshaphat's sake was he intervening. Elisha first asked for someone to play him some music. This was done, and Elisha received a vision of what to do. He passed on a command from God to dig ditches throughout the valley, and that those ditches would soon fill with water, enough for their armies, their livestock, and their beasts of burden. He then gave them very specific commands: that they should destroy Moab's cities, fill up their wells, cut down trees, and scatter stones on every piece of arable land. The next morning, the coalition made its meat sacrifice--and found the ditches filled with water, as Elisha had said. When the Moabites realized that they were coming under attack, they raised as large an army as they could. On the next morning, they looked out on a desert valley under a sun that made the water shine as if it were blood-red. This convinced the Moabites that the coalition soldiers were all dead. They then came down to try to despoliate the Israelites. When they had come close enough, the coalition troops rose up and counterattacked, with deadly effect. The Moabites fled in an all-out rout, and the coalition troops, in hot pursuit, destroyed everything in their path. At last they came to the city of Kirharaseth. There Masha, the king of all Moab, tried to sortie with a seven-hundred-man force to break through the line to the Edomite contingent. This failed, but Masha captured the heir to the Edomite throne. Him he offered as a whole burnt sacrifice on the city wall. The coalition took the city anyway, and then returned home, probably still shuddering from what they had seen. Elisha performed a great number of miracles, beginning with Jehoram's reign. The dates on these miracles are not entirely certain. In at least one case, Elisha must have intervened in someone's life on two separate occasions several years apart; Elisha's first intervention might even have occurred while he was still studying under Elijah. These events appear, not so much in chronological order as in logical order--that is, by type and by the sort of testimony they provide. However, the most reasonable assumption is that all these events were finished by the third or fourth year of the reign of Jehoram of Israel, in which year began the Second Syrian-Israeli War. This is so primarily because at least one of these events played a later key role in Elisha's career and Jehoram's history as king. A certain widow begged Elisha's help because the estate she inherited was very poor, and a creditor was pressing her sorely. Elisha learned from her that she had only a pot of oil. Elisha advised her to gather and borrow every vessel she could, and draw oil into them. She did--and the pot of oil never ran dry. When she had no more vessels to fill, Elisha advised her to sell the oil, repay the debts on her husband's estate, and live on what remained. A certain wealthy woman set aside a special place for Elisha to visit. One day he learned that she was desperately unhappy because she had never had a son. Elisha promised her that she would have one, and she did. Many years later, the lad suffered a great pain in his head and fell dead. Elisha returned to her house and raised the lad from the dead, in a manner quite similar to that by which Elijah had raised a young man under similar circumstances. In the fourth or fifth year of King Jehoram, Elisha returned to tell this same woman to remove to Philistia for seven years, to wait out a famine. When she returned, seven years later, she sued for the return of her land. Jehoram called Gehazi, Elisha's servant, as a witness to confirm the woman's account of Elisha restoring her son to life. Gehazi corroborated her account and identified the woman and her son. On that basis, the king restored her property to her. The company of prophets of which Elisha was the acknowledged leader made a pot of pottage, only to discover that the pottage was a deadly poison. Elisha added some more meal to the pot by his own hand, and the pottage was made wholesome. A man from Baalshalisha brought Elisha twenty loaves of barley and several full ears of corn, from the firstfruits of his harvest. Elisha encouraged his servant to use this food to feed a large number of people. The man was understandably skeptical, thinking that the food would barely provide a portion to a hundred men. But when Elisha repeated himself, he did as he was told. The food did indeed prove sufficient to feed all the people who came to eat. The story of Naaman the Syrian is especially famous, because Jesus Christ would mention it in His famous synagogue lesson in Nazareth. Naaman was chief-of-staff to King Benhadad II of Syria, and had an excellent reputation with the king, for the victories he had won. He was also stricken with leprosy. In his household was an Israelite woman, one of many hostages he had taken, who was his wife's lady's-maid. One day, the maid suggested to Naaman's wife that Naaman ought to seek help from "the prophet in Samaria," who could cure him. Another servant overheard this and passed it on to Naaman--but when Naaman passed this on to the king, the king somehow thought that the king of the Northern Kingdom could effect this cure. So Benhadad wrote a letter to Jehoram, along with ten talents of silver, six thousand pieces of gold, and ten suits of clothing, saying that he was sending Naaman to him for a cure. Elisha heard about this after Jehoram tore his clothes and asked whether Benhadad was trying to provoke open warfare with the Northern Kingdom. Elisha told the king, in effect, to calm down and send Naaman to him, and he, Elisha, would handle the matter. Elisha told Naaman to wash seven times in the Jordan River. Naaman indignantly refused, saying that the Damascene rivers ought to do just as well. But his valets prevailed upon him to do this simple thing that Elisha suggested, so he did--and it worked. Naaman was so pleased that he wanted to bestow a gratuity on Elisha. Elisha would take nothing from Naaman except his pledge to worship no God but the God of Israel. Elisha's faithful retainer, Gehazi, then did a foolish thing. He ran after Naaman and his retinue and told them the lie that Elisha had sent him to ask Naaman for a donative of a talent of silver and two suits of clothes. Naaman gave him two talents, and thus became possibly the first named victim of charity fraud. But when Elisha heard about it, he rebuked Gehazi, and then laid upon him a terrible curse: that he and his descendants would all be lepers. The Bible ends this sorry story with Gehazi being so stricken, and quite severely. One day, Elisha and his prophets' company were on the banks of the Jordan, cutting down trees to make beams to build another dormitory for themselves. One of the men broke his ax handle, and watched in horror as the head sank to the bottom. He cried out to Elisha and said that he could not afford to lose the ax head, because the ax was borrowed. Elisha asked where the ax head had fallen. The man told him, and Elisha threw a stick into the water. The ax head, though it was made of iron, actually floated to the surface so that Elisha and his man could retrieve it. Not long after the ax-head incident – and in perhaps the third or fourth year of Jehoram's reign – Benhadad II launched yet another war against the Northern Kingdom. Benhadad established his camp in two different places, hoping to capture Jehoram – and each time Elisha sent a message to the king to stay away from that spot, and the king took his advice. Benhadad was furious at these two successive intelligence failures. His staff said that Elisha could hear what was being whispered in the king's bedroom--a not entirely accurate thing, of course. Benhadad ordered that Elisha be tracked down and captured, no matter what city he was staying in. His spies found out that Elisha was in Dothan, and Benhadad sent a large force to surround the city. Elisha's own servants were aghast at the sight, but Elisha encouraged them not to fear. He then prayed to God that the Syrian besiegers be struck blind--and they were. Elisha then led them straight into the center of Samaria and had their eyes reopened. Jehoram, on Elisha's advice, took them captive, but only long enough to set a great feast before them and then to release them. They returned, and Benhadad did not invade for several months to come. Benhadad later marched his entire army to Samaria and laid siege to it – and so tight was that siege that famine and scarcity were the order of the day. Prices of food and fertilizer were, by the standards of the time, astronomical. Eventually King Jehoram heard a particularly disgusting and sickening lawsuit, in which the plaintiff complained that, after surrendering her son for consumption by herself and a neighbor, now the neighbor was unwilling to return the grisly favor. Jehoram tore his royal robes and wore sackcloth. But quite unreasonably he blamed Elisha for the famine and swore to God that he would have Elisha summarily beheaded. Elisha shut himself up in his house and prepared to refuse to see the king's messenger. Happily, the messenger arrived with a contrite acknowledgment that the evil that now befell the city was the Lord's doing.II_Kings 6:30-33 (NASB) Elisha then assured the messenger that, on the next day, prices would fall to normal. When a nobleman and senior adviser to the king questioned that, Elisha said that he would see it happen, but would not partake of it. The next morning, four lepers brought an incredible report to the king: that the Syrian army had fled en masse and left their camp behind, together with all their provisions and beasts of burden. The king, highly skeptical, sent out a search party to investigate, and they confirmed the report. The people then streamed out of the city and despoiled the Syrian camp. But in their rush, they trampled to death a nobleman whom the king had detailed to guard the city gate--and this man was the same adviser who had doubted Elisha's confident prediction of the raising of the siege. Toward the end of Jehoram of the Northern Kingdom (either 885 BC or 841 BC), Elisha traveled to Damascus, capital of Syria. There Benhadad II lay ill, and sent his adviser Hazael to inquire of Elisha whether he would recover from his illness. Hazael did come to Elisha, and Elisha told Hazael that he should tell Benhadad that he would recover, but in fact Benhadad was going to die. Then Elisha tearfully confessed to Hazael that the word of God called for Hazael to lead the Syrians in war against the Northern Kingdom and to afflict it grievously. Hazael asked Elisha what sort of man he thought Hazael was, and Elisha then told him straight-out that Hazael would be Syria's next king. Hazael returned to Benhadad's bedside to deliver Elisha's message. The next morning he smothered Benhadad with a water-soaked cloth, and took over the kingdom. For a second time a Northern-Southern coalition laid siege to Ramoth-gilead, in 884 BC (or 841 BC). This time, King Jehoram was seriously wounded--and King Ahaziah of Judah stayed by his bedside. Now Elisha gave orders to one of his followers to go to Ramoth-gilead and seek out one Jehu, son of Jehoshaphat son of Nimshi. The follower was to pour oil over Jehu's head, tell him that God meant him to be king of the Northern Kingdom, and then run away fast. The follower did exactly as Elisha had told him. Thus began a great conspiracy that ended in the deaths of the kings of both the Northern and the Southern Kingdoms in the same year, the destruction of the House of Omri, and the establishment of the House of Jehu. Elisha died in the first year of the reign of Joash of Israel (841 BC or 798 BC). The new King Joash came to see Elisha and said, "My father, my father, the chariot of Israel, and its horsemen!" – the exact same words that Elisha had uttered to the departing Elijah on the day of his investiture. Elisha had one more prophecy to deliver, and he did now. He asked Joash to pick up a bow and arrows, notch an arrow into the bow, and shoot, and told Joash that he would win in war against the Syrians. Then Elisha asked Joash to strike the floor with the arrows – and Joash struck the floor only three times. Elisha told him that because he had stopped striking the floor, he would have only three victories against Syria in war. Then Elisha died, and was placed into a sepulchre. But he worked one more miracle, even in death: a retreating Northern Kingdom army hastily laid a killed-in-action soldier in Elisha's sepulchre, and when the body touched the bones of Elisha, the soldier revived. The Coptic Monastery of Saint Macarius the Great claims to have relics originally belonging to Elisha and to John the Baptist. This page was last modified on 8 August 2014, at 20:12.